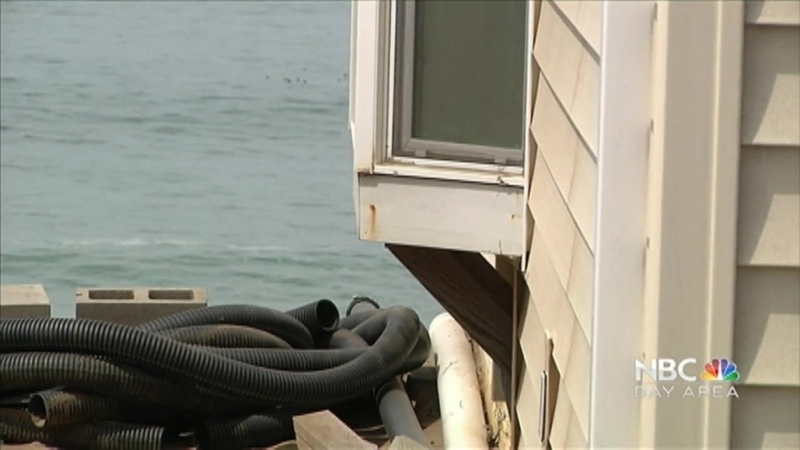 Along the coast in Pacifica, many homeowners have been watching their backyards shrink due to erosion. One family is taking action to save their home even though they can’t protect their property. The McConnells are literally having their house lifted and moved away from the cliff. The plan is to slide the home 15 feet away from its current location. "We put our heart and soul and every spare dime into that house," homeowner Melissa McConnell said. She and her husband picked the paint color to match the ocean when they moved into 532 Esplanade Ave. in Pacifica seven years ago. "It’s a place to spend your last day on Earth, which is what I would have liked to have done," McConnell said. Soon, their ocean front address will change, but her dream house doesn’t have to. "Why tear down a perfectly good house because of erosion?" McConnell asked. Powerful El Nino storms in January pummeled the cliff below the house, destroying the retaining wall and the once modest backyard. "It was either do it now or possibly lose the house," Gino Medeiros of Tony Medeiros Wacker & Sons said. Tuesday, his crews lifted the house from the foundation, and on Wednesday they will "basically roll the house forward." The house will essentially park on what’s left of the property until the family can find and afford a nearby lot to move it to. McConnell said she is desperately looking for a location in the same area so she can continue to call Pacifica home. "We can move the house," McConnell said. "We can save our dream." A dream that still includes an ocean blue kitchen.